Have you started planning your kids summer camps yet? You know summer is going to be here before you know it. Is your child interested in Soccer? Have you heard about Challenger Sports Soccer Camps? Challenger Sports Soccer Camps is the most popular camp in North America -with 150,000 campers! How are Challenger Sports Soccer camps different from other sports camps out there? Challenger Sports Soccer Camps have an innovative curriculum that develops skills, speed and confidence in players ages 3-18, Challenger Sports Soccer Camps provide boys and girls with the rare opportunity to receive high-level soccer coaching from a team of international expert’s right in the heart of their own community. In addition to teaching new skills and improving game performance, each Challenger Sports Soccer Camp provides lessons in character development, cultural education and is the most fun your child can have learning the sport they love! My son participated last year and really enjoyed it. He was tired by the end of the day but really enjoyed being instructed by English coaches. Does this camp sound like something you and your kids would enjoy? There is some motivation to enroll now. Enroll you child in a Challenger Sports Soccer Camp today Enroll in Challenger Sports Soccer Camps Today! FREE Water Bottle with code: USFG16 . 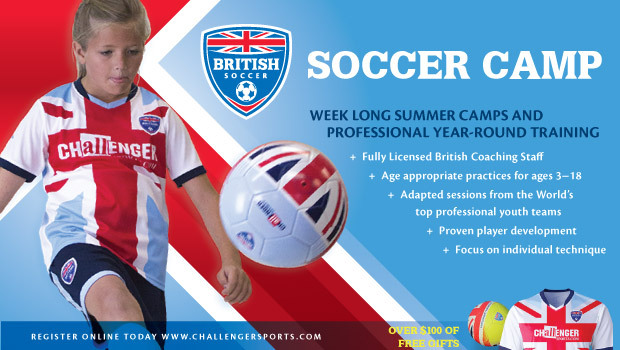 Challenger Sports Sign up for Challenger Sports Soccer Summer camps today.